It is often said that to fully understand life you need to understand the good, the bad and the ugly. Likewise, to fully understand Cambodia, you need to understand how beliefs can raise humanity to great heights or push it to terrible depths. Cambodia is as much the sacred walkways of Angkor Wat as it is the Khmer Rouge – the Communist Party of Kampuchea responsible for the 1970s genocide that left about two million Cambodians dead. Thirty-seven years later, the impact of those events on the nation is still stark and painful. 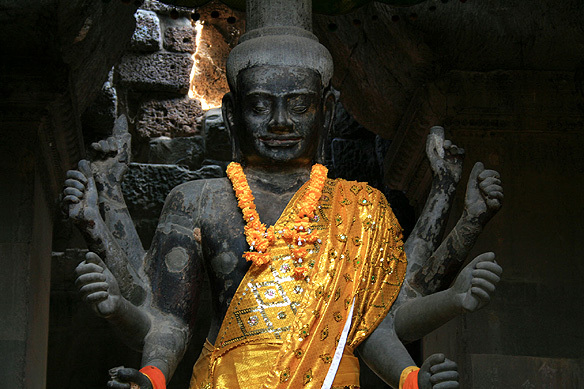 Both eras christened themselves Khmer. One emerged sacred, the other ugly, as I learnt during my travels. After decades of war and suffering, peace has finally come to Cambodia, and a journey to this small constitutional monarchy is truly one of Asia’s most genuine adventures. Like all travellers, I too loved Angkor; the dusty tropical jungles wrapped around stone temples whose gigantic carved cupolas rose over the foliage. No matter how much you read about Angkor or see pictures of its monuments, the actuality of the place still takes you by surprise. 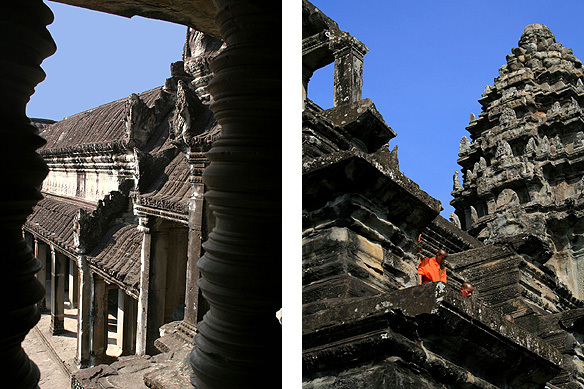 At its peak, Angkor was the biggest city in the world. It covered a thousand square kilometres with an approximate population of a million. “What inspired your grandeur?” I asked the stones and they recounted a tale of devarāja. 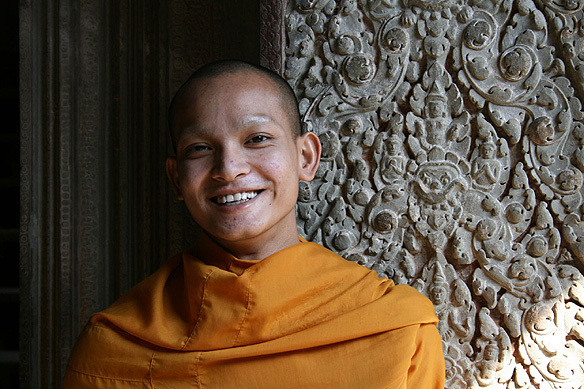 In 802 AD, Cambodia was united by the Hindu Khmer ruler Jayavarman II, propagator of devarāja or the god-king cult in the kingdom. What this meant was that he was to be conceived as a manifestation of the Hindu gods Shiva or Vishnu. In addition, he and his successors had the divine right to rule. 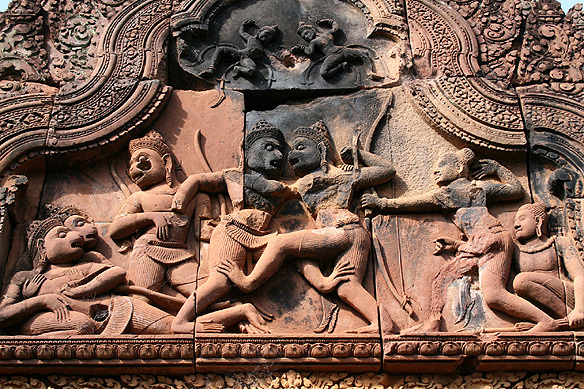 The dynasty and the cult lasted for over 600 years until 1431 AD, and ruled over much of Laos, Thailand and Vietnam. History and the sandstone blocks remember Jayavarman VII (1181 to 1215 AD) as the empire’s greatest ruler. Taking his role as god-king to new heights, he expanded imperial territory, built monumental temples, huge reservoirs, highways 800 kilometres long, a hundred hospitals, and the spectacular Angkor Thom complex — a city within a city in Angkor. 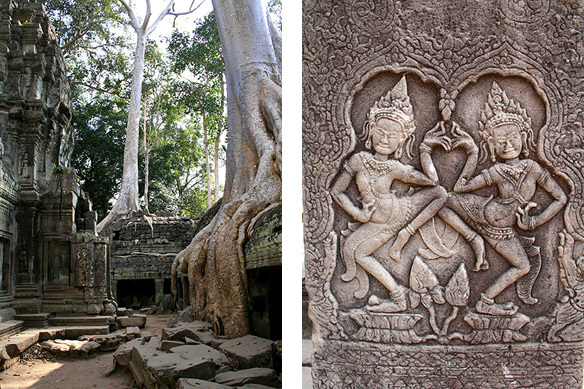 Angkor literally translates to Capital City or Holy City and comprises a hundred royal temples. 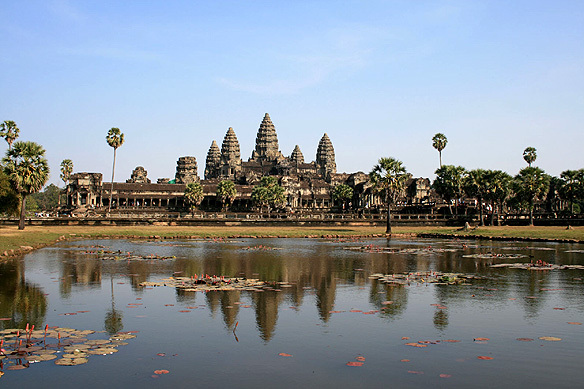 Angkor Wat, the largest of them, as well as the largest religious structure in the world was built by Suryavarman II in the early 11th Century. A representation of Mount Meru, the home of the gods, the Wat is both a temple complex dedicated to Vishnu and a mausoleum for Suryavarman II with great attention paid to minutiae — over 3,000 apsaras, featuring between them more than 30 different hairstyles, are carved into its walls. If Angkor is testimony to the creative highs that divine rule can reach, the Khmer Rouge represents the opposite. If Angkor made me revel in my humanity, the “monuments” of the Khmer Rouge made me wonder if I too was capable of depravity. When the Ultra Communist Khmer Rouge (Red Khmer) marched into Phnom Penh on 17 April, 1975, few would have anticipated the hell that was to follow. 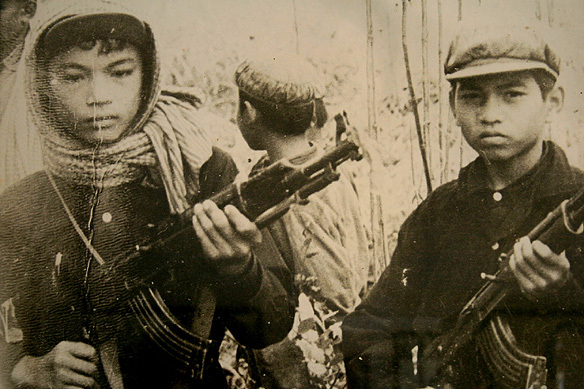 The goal of the regime was to transform Cambodia into a Maoist, peasant-dominated agrarian cooperative. Within days, the population was forced to march to the countryside and undertake slave labour in mobile work teams for 12 to 15 hours each day. The advent of Pol Pot, Brother No 1, who led the Khmer Rouge regime between 1975 and 1979, was declared Year Zero. Currency was abolished and postal services were halted. Except for one fortnightly flight to Beijing the country was cut off completely from the outside world. Two sites in Phnom Penh let me step back into this period. In May 1976, Pol Pot took over Tuol Svay Prey High School and turned it into Security Prison 21 (S-21), the largest prison and interrogation centre in the country with up to 100 intakes a day. Inmates were electrocuted, sometimes over a period of months. 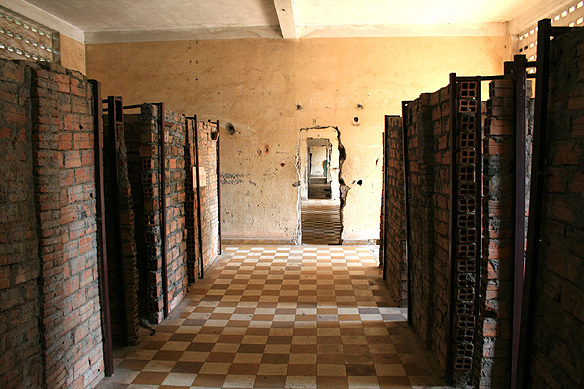 The Khmer Rouge was meticulous in keeping records. Every prisoner who passed through was photographed, before and after torture, and detailed biographies recorded. Shackled to the walls and stripped to their underwear, the prisoners slept on the floor, and defecated and urinated into small buckets. Medical treatment was unheard of. Much of the school, now the Tuol Sleng Genocide Museum, has been left in the state it was found in when the Vietnamese army liberated Phnom Penh on 7 January, 1979. Displays include roomfuls of black and white photographs. Nearly all the men, women and children pictured were later killed. The visit to the Genocide Museum is not an easy one. I couldn’t cry; I couldn’t get angry. All I could feel was the hollowness of those eyes, staring out from the rows of photographs. Following in the footsteps of these prisoners, I drove on to the Choeung Ek killing fields. It was here that 17,000 men, women, and children, detained and tortured at S-21, were executed. No Cambodian can be said to be entirely free of the madness of that era. Every family has one or more members who died in it. A certain vacantness in the Cambodian spirit still echoes those years. One race; two sides of history, both in the name of Khmer and the supremacy of a single man. One path through history turned towards the spiritual and the glorious arts emanating from it; the other turned towards the killing fields. Both paths have much to teach us about the nature of mankind. This entry was posted in Cambodia, Exploring our World and tagged Angkar, Angkor Wat, Buddhism, Choeung Ek Killing Fields, Democratic Kampuchea, Devaraja, Divine Rule, Hinduism, Hindustan Times, Jayavarman VII, Khmer Empire, Khmer Rouge, Phnom Penh, Pol Pot, Red Khmer, Security Prison 21, Suryavarman II, Ta Prohm, Temple Architecture, Things to see in Cambodia, Tuol Sleng Genocide Museum, UNESCO World Heritage Site, Year Zero by Rama Arya. Bookmark the permalink. Cambodia and Angkor Wat left me with a feeling that grandeur and idealism knows a decline and rot. I tried re-drawing the scene of that era, and Mount Kailash didn’t give its elated magnetism as expected. The country still seeps in shame, and unreal dimension of child prostitution as a desperate way to shake out from dire poverty. Somewhat reality is warped.